In 1943, Wewak was the site of the largest Japanese air base on the mainland of New Guinea. It suffered repeated bombing attacks by the United States and Royal Australian Air Forces, most notably on 17 August 1943, when heavy bombing and strafing by 150 Allied aircraft destroyed an estimated 50 percent of the Japanese aircraft on the ground. Temporarily home to the 18th Japanese Army, the Americans, believing it cut off and no longer of any real threat or particular strategic importance, bypassed the base and instead landed at Aitape, a small town 150 kilometres west of Wewak. 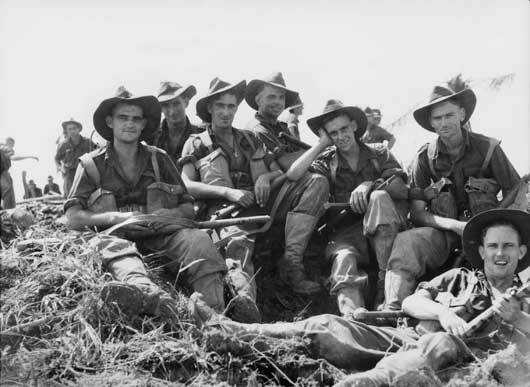 In October 1944, Australian soldiers of the 6th Division began to take over from the Americans stationed at Aitape. Once the Australians were established they began two advances, east along the coast to Wewak, and the other inland across the Torricelli Mountains to the Japanese supply base at Maprik. The Japanese put up stiff resistance in a campaign fought over challenging jungle terrain that resulted in a large number of casualties from both battle and disease. There were 442 Australians killed and 1,141 wounded in the last campaign of the 6th Division that had first seen action at Bardia in January 1941. Wewak Point was successfully captured on 10 May and by 15 May Wewak and the surrounding coastal area was in Australian hands. Operations against the Japanese in the Aitape-Wewak would continue until the end of the war in August 1945. 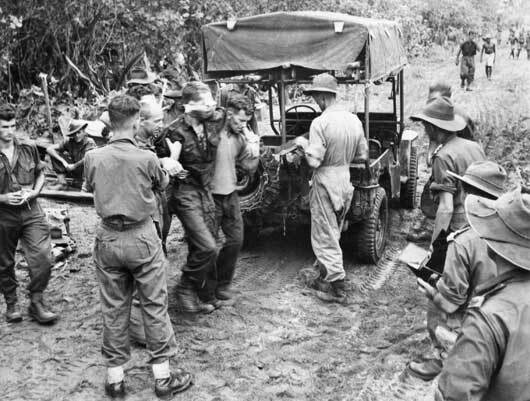 A wounded Australian soldier being helped to a jeep-ambulance on a forward track in Aitape Sector, New Guinea (AWM 018290). 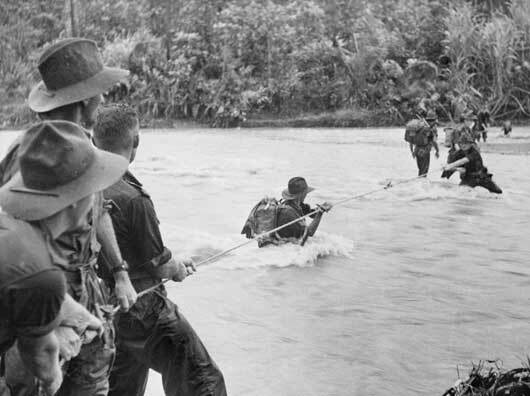 Australian soldiers negotiating a flooded river close to But aerodrome, Aitape Sector (AWM 018294). 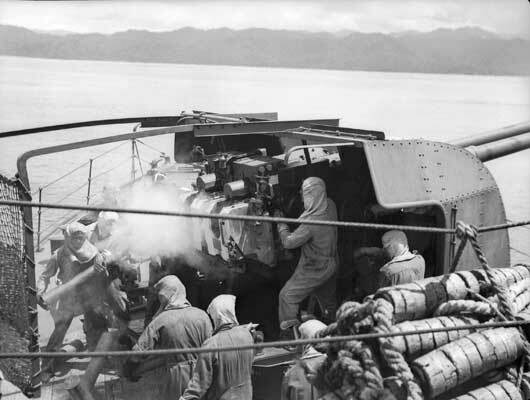 The crew of the 4-inch twin guns aboard the RAN vessel HMAS Swan laying down a barrage on Japanese positions between Aitape and Wewak (AWM 079323). No. 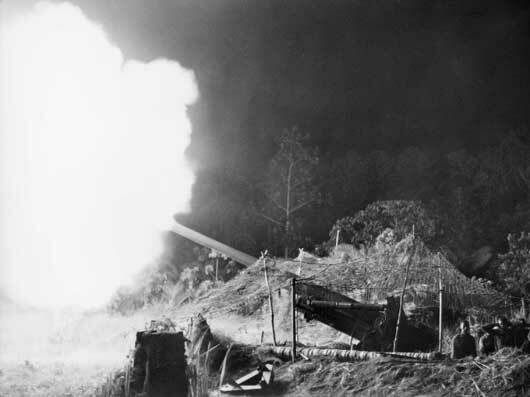 1 gun, 2/3 Field Regiment, in action during the final assault against Wewak (AWM 091715). Private A.L. 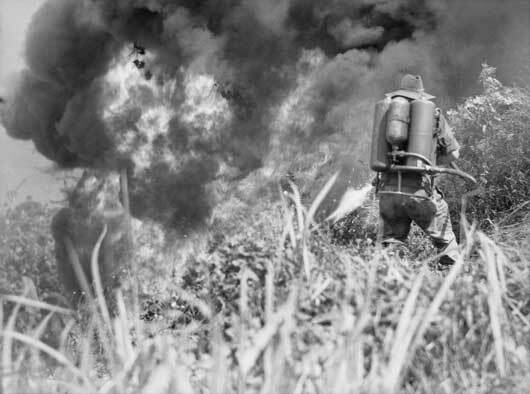 Willett, 2/8 Infantry Battalion, using a flame thrower in the action against the Japanese (AWM 091749). 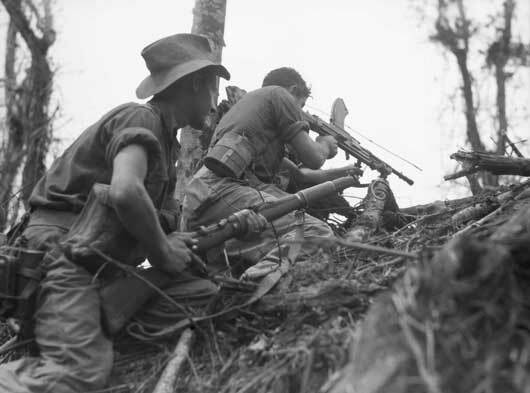 Members of C Company, 2/8 Infantry Battalion, giving covering fire against Japanese positions on Mount Shiburangu (AWM 093451). A group portrait of members of A Company, 2/8 Infantry Battalion, resting around a shell crater in the Wewak area (AWM 094025). 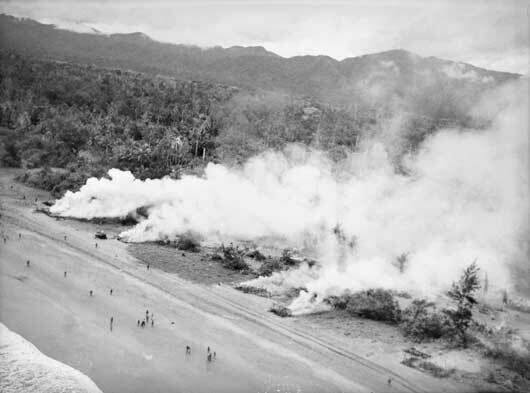 Smoke billowing from targets set on fire by Beaufort Bomber aircraft of 8 and 100 Squadron RAAF, designed to "smoke out" the Japanese (AWM OG1589). 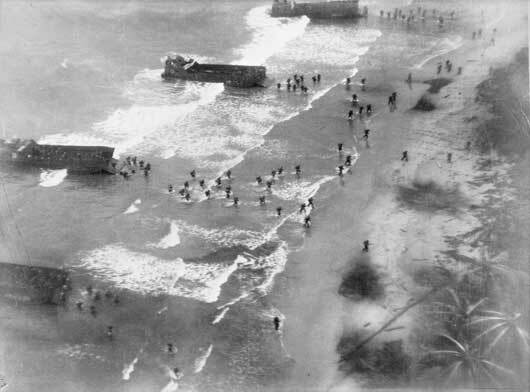 Part of "Farida Force" of the 6th Australian Division, landing on the beach at Dove Bay, east of Wewak during the final assault on the area (AWM OG2945).